Bringing a life into the world means it's time to get life insurance if you don't already have it, or up your coverage if you do. 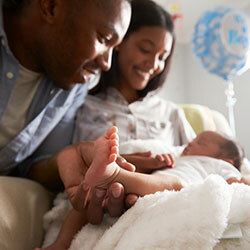 Becoming a parent is one of those life-changing occasions that compels many people to buy life insurance, because, underneath the excitement of bringing your newborn home for the first time is also a concern for what lays ahead, especially when it comes to the family's finances. From a money standpoint, your finances will never be the same. You may need to move, buy a larger vehicle, and pay for child care, for example. Of course, there are other expenses too, which is why it's important to set aside time to do some serious financial planning as your family grows. A financial plan will help you manage, save and grow your money confidently. A key component of your overall financial plan is life insurance. Admittedly, discussing life insurance is a tough talk to have because no one really wants to talk about their own death or the death of a loved one. With a child now relying on you, however, the time to say "someday" or "later" has passed. A growing family is a lot of responsibility and with it comes the responsibility of preparing for the "what if" scenario. What if something happened to either parent, and how will it affect the family financially? There's a lot to consider, because there's a lot at stake. Fully cover the cost of funeral arrangements? Go towards the costs of raising your children until they're adults? Pay off outstanding debts like a mortgage, car loan or credit card? Contribute to the cost of post-secondary education for your children? Leave your children with an inheritance? Give the surviving parent the means to temporarily leave their job, or reduce their hours, until they get back on their feet? As your family grows and there are more people to provide for, you may need to consider adding more coverage as the years go by.